Californian Kyle Larson grabbed the lead on Lap 6 of Tuesday’s Warren CAT Qualifying Night 25-lap A-Feature en route victory during the 33rd annual Lucas Oil Chili Bowl Nationals presented by General Tire. 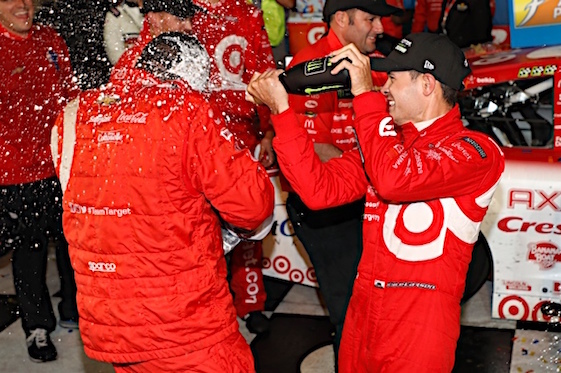 A rising NASCAR Cup Series star with Chip Ganassi Racing, Larson punched a ticket into his eighth 55-lap championship event Saturday night at Tulsa Expo Raceway. After chasing Zach Daum for the first five laps, Larson tested top and bottom of the track before rolling by the Illinois racer on the cushion exiting Turn 2. Moving top-shelf in pursuit of the McDonald’s No. 01, Daum as unable to keep pace as Larson reeled in slower traffic. Earlier, Tanner Thorson led non-stop to claim his second victory in the 11th annual Vacuworx Invitational Race of Champions. Wheeling a new Clyde Lamar-owned entry, the famed No. 3c from California was untouchable. Outrunning Larson to the win, the final podium step went to hard-charging Oklahoman Christopher Bell, who advanced 12 positions. Ryan Bernal and J.J. Yeley completed the top-five. The week began with Californian Logan Seavey leading the 25-lap A-Feature flag-to-flag to win the first Monday Qualifying Night event from pole position in the Keith Kunz Motorsports No. 67. “To have the night we had, everything just fell into place, and that’s kind of what it takes for this race is for stuff just to go your way,” said Seavey, the 44th different Preliminary Night winner. Seavey and runnerup Brady Bacon advanced into Saturday night’s A-Feature. Tuesday’s program saw 69 drivers drawing in to bring the event total to 132. Through the second night of action, the Chili Bowl Flip Count is up to 15. All drivers have been able to walk away. The Chili Bowl Nationals continue Wednesday with Hard Rock Hotel and Casino-Tulsa Qualifying Night. Hot Laps will get underway at 4 p.m. (CST) with racing at 5 p.m. A field of 74 drivers is expected. Fans can follow all Chili Bowl action on Facebook, Twitter and Instagram with @CBNationals. All official press, updates and results can be found online at http://www.chilibowl.com. Heat 1 (8 Laps): 1. 15H-Sam Hafertepe Jr., ; 2. 89-Tanner Berryhill, ; 3. 18-Tony Bruce Jr., ; 4. 32-Gary Taylor, ; 5. 35-Sterling Cling, ; 6. 15L-Merril Lamb, ; 7. (DNF) 5J-Jeff Crook, ; 8. (DNF) 77U-Chris Urish, . Heat 2 (8 Laps): 1. 99-Larry Wight, ; 2. F5-Tye Mihocko, ; 3. 7U-Kyle Jones, ; 4. 17D-Donovan Wise, ; 5. 20H-Noah Harris, ; 6. 91A-Chris Andrews, ; 7. 45-Roger Crockett, ; 8. 84-Jeremy Campbell, . Heat 3 (8 Laps): 1. 1K-Brayton Lynch, ; 2. 55X-Alex Bowman, ; 3. 15C-Carson Garrett, ; 4. 74M-Adam Pierson, ; 5. 41B-Brad Wyatt, ; 6. 37-Terry Babb, ; 7. 3D-Dustin Gilbert, ; 8. 51W-Curtis Jones, . Heat 4 (8 Laps): 1. 75-Bryan Stanfill, ; 2. 5D-Zach Daum, ; 3. 71-Jesse Colwell, ; 4. 2W-Wyatt Burks, ; 5. 5B-Bobby Brewer, ; 6. 98B-Joe Boyles, ; 7. (DNF) 7F-Travis Ashwood, ; 8. (DNF) 14-Harley Hollan, . Heat 5 (8 Laps): 1. 01-Kyle Larson, ; 2. 29-Tim Buckwalter, ; 3. 47B-Andrew Layser, ; 4. 31B-Michael Faccinto, ; 5. 21M-Michelle Melton, ; 6. 85-Matt Johnson, ; 7. 17F-Devin Camfield, ; 8. PE3-Andy Bradley, . Heat 6 (8 Laps): 1. 7C-Tyler Courtney, ; 2. 3S-Brian Shirley, ; 3. 44X-Wesley Smith, ; 4. 9JR-Derek Hagar, ; 5. 46-Kenney Johnson, ; 6. 15W-Jeff Wimmenauer, ; 7. 44-Don Droud Jr., ; (DNS) 10J-John Hunt. Heat 7 (8 Laps): 1. 2S-Travis Scott, ; 2. 7M-Brody Roa, ; 3. 4F-Chad Frewaldt, ; 4. 3T-Taylor Peterson, ; 5. 45K-Kyle Hammer, ; 6. (DNF) 84M-Alex DeCamp, ; 7. (DNF) 27Z-Zane Hendricks, . Heat 8 (8 Laps): 1. 8J-Jonathan Beason, ; 2. 25S-Frank Flud, ; 3. 27J-Jake Bubak, ; 4. 17E-Blake Edwards, ; 5. 7AU-Mark Cooper, ; 6. 23X-Billy Lawhead, ; 7. 88A-Andy Michner, . Heat 9 (8 Laps): 1. 99P-Dillon Welch, ; 2. 2B-Jason Grady, ; 3. 42-Chris Cochran, ; 4. 51M-Slater Helt, ; 5. 9U-Doug McCune, ; 6. 44D-Evan Turner, ; 7. 94K-Christopher Polvoorde, . C-Feature 1 (12 Laps): 1. 84M-Alex DeCamp, ; 2. 77U-Chris Urish, ; 3. 21M-Michelle Melton, ; 4. 9U-Doug McCune, ; 5. 45-Roger Crockett, ; 6. 5B-Bobby Brewer, ; 7. 98B-Joe Boyles, ; 8. 17F-Devin Camfield, ; 9. 14-Harley Hollan, ; 10. 23X-Billy Lawhead, ; 11. 3D-Dustin Gilbert, ; 12. (DNF) 88A-Andy Michner, ; 13. (DNF) 37-Terry Babb, ; (DNS) 7F-Travis Ashwood, ; (DNS) 10J-John Hunt. C-Feature 2 (12 Laps): 1. 91A-Chris Andrews, ; 2. 15W-Jeff Wimmenauer, ; 3. 44-Don Droud Jr., ; 4. 85-Matt Johnson, ; 5. 45K-Kyle Hammer, ; 6. 44D-Evan Turner, ; 7. 15L-Merril Lamb, ; 8. (DNF) 51W-Curtis Jones, ; 9. (DNF) 41B-Brad Wyatt, ; 10. (DNF) PE3-Andy Bradley, ; 11. (DNF) 94K-Christopher Polvoorde, ; 12. (DNF) 84-Jeremy Campbell, ; (DNS) 5J-Jeff Crook, ; (DNS) 27Z-Zane Hendricks. Qualifier 1: 1. 15H-Sam Hafertepe Jr., ; 2. 5D-Zach Daum, ; 3. 71-Jesse Colwell, ; 4. 89-Tanner Berryhill, ; 5. 44X-Wesley Smith, ; 6. 25S-Frank Flud, ; 7. 29-Tim Buckwalter, ; 8. 20H-Noah Harris, ; 9. 1K-Brayton Lynch, ; 10. 15C-Carson Garrett, . Qualifier 2: 1. 7C-Tyler Courtney, ; 2. 01-Kyle Larson, ; 3. 7U-Kyle Jones, ; 4. F5-Tye Mihocko, ; 5. 7M-Brody Roa, ; 6. 32-Gary Taylor, ; 7. 7AU-Mark Cooper, ; 8. 74M-Adam Pierson, ; 9. 75-Bryan Stanfill, ; 10. 4F-Chad Frewaldt, . Qualifier 3: 1. 27J-Jake Bubak, ; 2. 18-Tony Bruce Jr, ; 3. 8J-Jonathan Beason, ; 4. 47B-Andrew Layser, ; 5. 55X-Alex Bowman, ; 6. 2S-Travis Scott, ; 7. 9JR-Derek Hagar, ; 8. 2W-Wyatt Burks, ; 9. 3T-Taylor Peterson, ; 10. 17D-Donovan Wise, . Qualifier 4: 1. 31B-Michael Faccinto, ; 2. 99P-Dillon Welch, ; 3. 17E-Blake Edwards, ; 4. 3S-Brian Shirley, ; 5. 42-Chris Cochran, ; 6. 35-Sterling Cling, ; 7. 51M-Slater Helt, ; 8. 2B-Jason Grady, ; 9. (DNF) 99-Larry Wight, ; 10. (DNF) 46-Kenney Johnson, . B-Feature 1 (15 Laps): 1. 99-Larry Wight, ; 2. 74M-Adam Pierson, ; 3. 25S-Frank Flud, ; 4. 84M-Alex DeCamp, ; 5. 4F-Chad Frewaldt, ; 6. 2B-Jason Grady, ; 7. 32-Gary Taylor, ; 8. 77U-Chris Urish, ; 9. 9U-Doug McCune, ; 10. 75-Bryan Stanfill, ; 11. 17D-Donovan Wise, ; 12. 21M-Michelle Melton, ; 13. (DNF) 44X-Wesley Smith, ; 14. (DNF) 7AU-Mark Cooper, ; 15. (DNF) 51M-Slater Helt, ; 16. (DNF) 42-Chris Cochran, . B-Feature 2 (15 Laps): 1. 17E-Blake Edwards, ; 2. 3S-Brian Shirley, ; 3. 9JR-Derek Hagar, ; 4. 29-Tim Buckwalter, ; 5. 2S-Travis Scott, ; 6. 2W-Wyatt Burks, ; 7. 1K-Brayton Lynch, ; 8. 46-Kenney Johnson, ; 9. 15W-Jeff Wimmenauer, ; 10. 85-Matt Johnson, ; 11. 15C-Carson Garrett, ; 12. 35-Sterling Cling, ; 13. 20H-Noah Harris, ; 14. 44-Don Droud Jr., ; 15. 3T-Taylor Peterson, ; 16. (DNF) 91A-Chris Andrews, . VIROC XI (20 Laps): 1. 3C-Tanner Thorson, ; 2. 01-Kyle Larson, ; 3. 71W-Christopher Bell, ; 4. 39-Ryan Bernal, ; 5. 2J-J.J. Yeley, ; 6. 67-Logan Seavey, ; 7. 47-Danny Stratton, ; 8. 9-Tim McCreadie, ; 9. 97-Rico Abreu, ; 10. 67Z-Kasey Kahne, ; 11. 27-Tucker Klaasmeyer, ; 12. 05-Brad Loyet, ; 13. 1-Sammy Swindell, ; 14. 84X-Chad Boat, ; 15. 11-Tracy Hines, ; 16. 36-Dave Darland, ; 17. 92-Aaron Reutzel, ; 18. 1R-Brad Sweet, ; 19. 22-John Heydenreich, ; 20. (DNF) 71G-Damion Gardner, . A-Feature (25 Laps): 1. 01-Kyle Larson, ; 2. 5D-Zach Daum, ; 3. 8J-Jonathan Beason, ; 4. 31B-Michael Faccinto, ; 5. 15H-Sam Hafertepe Jr., ; 6. 7C-Tyler Courtney, ; 7. 99P-Dillon Welch, ; 8. 71-Jesse Colwell, ; 9. 55X-Alex Bowman, ; 10. 89-Tanner Berryhill, ; 11. 47B-Andrew Layser, ; 12. 74M-Adam Pierson, ; 13. 7M-Brody Roa, ; 14. 29-Tim Buckwalter, ; 15. 7U-Kyle Jones, ; 16. 17E-Blake Edwards, ; 17. 18-Tony Bruce Jr., ; 18. 25S-Frank Flud, ; 19. 9JR-Derek Hagar, ; 20. 84M-Alex DeCamp, ; 21. 3S-Brian Shirley, ; 22. F5-Tye Mihocko, ; 23. (DNF) 99-Larry Wight, ; 24. (DNF) 27J-Jake Bubak, . Lap Leader(s): Zach Daum 1-5; Kyle Larson 6-25. Hard Charger: Timmy Buckwalter, plus-10.